Highlights: Sightseeing in New York City, Philadelphia, Washington DC, Corning, Niagara Falls, Toronto, Thousand Islands, Ottawa, Montreal, Quebec City and Boston. 7 nights 4 stars hotel accommodations. Round trip transportation and tour guide. Today, guests will arrive at one of the there major airports in the New York City Area (JFK, LGA, EWR), where they will be met by a tour guide at the baggage claim. There is a complimentary shuttle service from the airport to the hotel. Guests who arrive at JFK or LGA before 3:00pm have the option of joining a tour in Flushing, Queens. Those arriving at EWR before 12:00 can go to the Jersey Garden Outlets Mall for an additional $10. All who arrive before 4:30pm can join an optional Night Tour of the city. Flushing, NY This famous and historical New York neighborhood is best known for its flourishing Chinatown area, the second-largest in New York City and the most quickly growing. Today, it is even larger than the Chinatown in Manhattan. Always Available NYC Night Tour First we will visit Rockefeller Center, before moving on to Times Square, and then our last stop, an observation deck in New Jersey, offers romantic, panoramic views of New York City. We will spend the day touring New York City, seeing all the best sights this metropolis has to offer. We will take a sightseeing cruise to get close to the Statue of Liberty and the Brooklyn Bridge. Then, we will go to the USS Intrepid Sea Air and Space Museum. In the Financial District, we will visit the New York Stock Exchange, the Charging Bull, Trinity Church, the metropolitan Museum of Art, Times Square, we may visit the Madame Tussauds Wax Museum in New York or the wax museum in Washington D.C. (base on traffic condition), and the Museum of Modern Art. Later, on a bus tour, we will see Fifth Avenue, Rockefeller Center, the United Nations Headquarters, Ground Zero, and the under-construction Freedom Tower. 2016, according to the traffic condition in New York, we may visit the wax museum in Washington D.C. instead of New York Madame Tussauds Madame Tussauds Wax Museum The Washington, DC arm of this worldwide phenomenon is a sight to behold. Amazingly and sometimes eerily lifelike figures line the halls of this art museum in the form of celebrities and politicians both famous and infamous. Today, we will drive to Philadelphia to see Independence National Park, the location of Independence Hall and the Liberty Bell. Afterwards, we will continue on our way to Washington DC to visit the Lincoln Memorial, the Vietnam Veterans Memorial, and the Korean War Memorial. 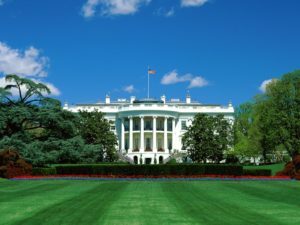 We can also take some photos of the exteriors of the White House and the US Capitol. Then, we will visit the National Air and Space Museum, followed by a Potomac River Cruise, during which we will see the Washington Monument, the World War II Memorial, and the Thomas Jefferson Memorial. Always Visit Independence National Historical Park This National Historical Park in Philadelphia, Pennsylvania serves as a way of preserving important Revolutionary War sites for future generations. Called “America’s most historic square mile,” this 55-acre park in the “Old City” district is not to be missed. Always Visit Lincoln Memorial This iconic American monument honors the 16th president of the United States. Abraham Lincoln was president during the American Civil War, and is most famous for the Emancipation Proclamation that freed all of the slaves in the US. Vietnam Veterans Memorial This memorial in Washington, DC serves as a place to remember the American soldier who were lost or killed during the tumultuous Vietnam War. Originally controversial in design, the simple memorial has become a shrine for the American people. Driving through the hilly countrysides of Pennsylvania and New York state, we will enjoy the rural scenery as we head north to visit the Corning Glass Museum in Corning, NY. We will then continue on to Niagara Falls, NY where we will take the famous Maid of the Mist boat ride (No boat operation in winter), if time is available, guests will have chance to take the impressive and exciting Niagara JETBOAT (JetBoat tour will be closed under tough weather or river icy condition). Then see the Adventure Movie. Guests can then choose either to stay in the Falls Park for self-exploration or have an in-depth tour that includes visits to the Whirlpool State Park and Old Fort Niagara. 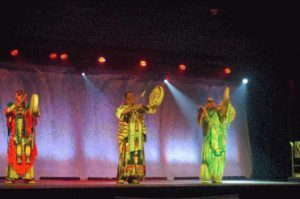 At dusk, there will be an exciting Traditional Native American Dance Show, and the night will be ended with the beautiful native singing and the gorgeous traditional dancing! Always Visit Corning Museum of Glass This museum in western New York is dedicated to the history, art, and science behind glassmaking. Its collection contains more than 45,000 objects, some of which date back millennia. It was founded in 1951 and sees 400,000 visitors annually. Closed during winter season Maid of the Mist This famous boat ride gets passengers up close and personal with the Niagara Falls! The Maid rides right into the mists thrown up by the roaring cascade as the Niagara River tumbles over the edge of the falls. 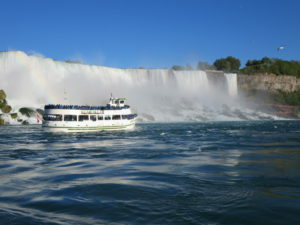 We will continue our tour Niagara Falls by heading into Canada to take the Hornblower Cruise boat ride and see an informational movie at the IMAX Theater. We will also ascend the Skylon Tower. The tour then departs for Toronto, ON, one of Canada’s largest cities. There we will visit the CN Tower and guests will have the option to take a Mariposa Toronto Harbour Cruise. We will have dinner in historical Chinatown. Always Visit Skylon Tower This observation tower on the Canadian side of Niagara Falls offers a bird’s-eye views of one of the world’s favorite natural wonders. The tower stands 520 feet from street level and 775 feet from the bottom of the falls. In winter time, customers will visit Ripley’s Aquarium of Canada and Casa Loma instead of Mariposa Toronto Harbour Cruise Mariposa Toronto Harbour Cruise Lake Ontario Cruises offer gorgeous views of the city of Toronto from the waters of Lake Ontario, one of the famous Great Lakes of North America. See the city of Toronto and the surrounding area in a new way! Seasonal Thousand Islands Cruise In addition to taking in the scenery, passengers on boat tours of this area can learn some of the history of the region– which was once home to pirates and bootleggers– and enjoy views of some famous spots. Always Visit Parliament Hill Parliament Hill, located on the banks of the Ottawa River Canada’s capital city, is home to the Canadian Parliament. The gorgeous location and dramatic architecture make this a huge tourist location– more than 3 million people come every year. Always Visit Olympic Stadium and Tower The “tower” portion of this Stadium, which was originally constructed for the 1976 Olympics, is the tallest inclined tower in the world, stretching 574 feet into the air. This enormous building has a capacity of 78,322. In the morning, we will leave Montreal and drive to the nearby city of Quebec City, QC, one of the oldest cities in North America. In addition to touring the city, we will visit the Place Royale. We will also get a chance to take pictures at Cathedral-Basilica of Notre-Dame de Quebec, the famous Chateau Frontenac Hotel, and the Parliament Building. After the conclusion of our tour, we will head back across the border back into the US, making our way to Boston, MA in time for a Lobster Dinner. After, we will head back for Boston. Winter Schedule: January – March We will have a short stay at duty-free stores, then head to Boston. Upon your arrival, it’s time for dinner and you will be recommended with its famous fresh lobsters feast. *In case of delays by U.S. Customs and Border entry procedure, you may have other meals instead of the lobster dinner. *Quebec tours are not available from Dec 30 to Mar 16. And during the Winter time, customers will have a short stay at duty-free stores, then head to Boston. Always Visit Place Royale Place Royale is a historic square located in the Lower Town area of Old Quebec. It was established as a trading post by Samuel de Champlain, the founder of Quebec City, and is now an important cultural site. Always Visit Boston Lobster Dinner (The lobster dinner is on a Chinese restaurant style) New England is known for its lobster. Having a lobster dinner in Boston is certainly on many a visitor’s to-do list. Today we will take a city tour of Boston, beginning with Trinity Church. Next we will explore the campuses of Harvard University and MIT. Then we will take a relaxing Boston Harbor Cruise giving us a breathtaking view of the city from the water. After spending the day in Boston, guests may choose to either leave from there or head back to New York. See “Departure and Return Details” for information on when to book flights. Always Visit Quincy Market Quincy Market in the Faneuil Hall marketplace of downtown Boston is a historic building that still serves as a souvenir marketplace and food court today. The area has expanded to include two other marketplace buildings as well. Prices are subject to change without prior notice. Tour route may be changed and reversed; you may contact the vendor 1-2 days prior departure to confirm final itinerary Customers are held solely responsible for their own travel documents and/or visas if required. Up to 46 days prior to departure – 10% of total purchase amount. 21-45 days prior to departure – 25% of total purchase amount. 8-20 days prior to departure – 50% of total purchase amount. 1-7 days prior to departure – 100% of total purchase amount. Day of departure or no show – 100% per person. We constantly strives to improve tour itineraries and features. If such improvements can be made, or unforeseen circumstances beyond our control make changes necessary – we reserve the right to vary itineraries and to substitute hotels. At certain peak periods duplicate departures may operate, and sometimes in reverse order in which case hotels may vary from those stated on the itinerary pages. We reserves the right to cancel or re-schedule any tour departure in accordance with operating requirements or circumstances beyond its control. If cancellation is made any time prior to departure* of the tour, Taketours’ only liability will be to refund to the passenger the amount it has received for the tour booking. We will try to re-book the same or similar tour.. Please note that we are not liable for any cancellation penalties incurred on any other travel arrangements including air tickets purchased separately from customers.